Immediately upon reading the press release and seeing the rather professional promotional video for the game, I was taken back to some very enjoyable weekends at the arcade playing “Police Trainer” with light guns that were never calibrated properly. Inaccurate light guns aside, the game had a quarter-munching progression system that made you always want to play a little longer than you really should have. 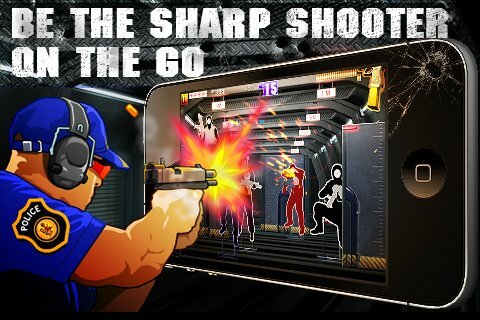 Professional Police Training 2 is clearly inspired by that old Police Trainer arcade game and even uses incredibly similar graphical assets and game modes. The gun models seem to be inspired by games like Counter-Strike, but you don’t see them all that often (just when reloading) to notice. If you are one of those users that goes into a rabid fit of rage the second In-App-Purchases are mentioned, you might want to do your heart a favor and stay far away from this. Everyone else, read on. PPT2 is a “Free” app with tons of In-App Purchases. Want to use a new gun? You could “rent” one for a period of time using earned in-game currency or you could buy it permanently using diamonds, which you earn by getting in-game achievements (very slowly) or purchasing with real money. The base price is 1 diamond = $0.10, but of course if you buy bigger bundles of diamonds you get a better price break. This is where the game starts to fall apart. The constant pressure to purchase something, be it new game modes, new stages for those modes, more perks, new guns, or even more ammo becomes incredibly irritating. The base price of ammo is 100 rounds for 1 diamond which is 1000 coins which can be purchased for $0.10 and trust me, you will be using a significant amount of ammo on the later levels, especially in the zombie game mode. What you are getting here is a pretty competent arcade target shooting gallery game with a Police Training theme. 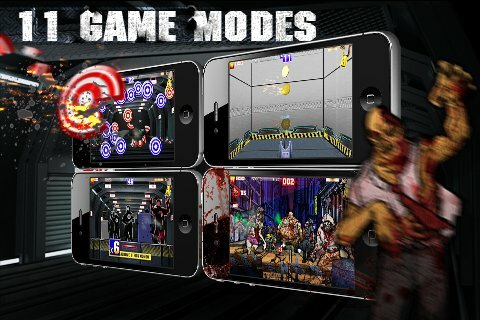 There are tons of game modes such as aombies, accuracy, speed training, and even a mode where you need to keep a coin in the air for a predetermined amount of time. Most of them are pretty enjoyable for the first 5 stages, but they tend to get quickly obscene in their difficulty. It felt like I would have better luck with a poorly calibrated light gun at times than my fingers poking at my iPad’s glass after seeing how poorly I did. If you are able to ration your play based on the daily stipends of coins and bonuses, or if you are a fan of games with the Facebook In-App Purchasing model, (Think Farmville, Mafia Wars) this may be worth spending a few bucks to get the extra bonuses and play modes. I will be keeping my eye on this game, since it has a lot of potential in the future as the developers have promised ongoing support and features. There are minor gripes that may throw people off other than the pricing system, such as infrequent crashes in hectic levels and the odd Engrish here and there, but they really aren’t that significant of problems right now.